Am I selling this to you yet? Just kidding. It’s really not that messy, and it makes your pumpkin pie just that much sweeter. And the roasting pumpkin smell that fills the house is so worth it. I made puree from sugar pumpkins as they are sweeter and have more flavour. A sugar pumpkin won’t have much guts, as its grown for its thick flesh that you can make into puree. It’s the one on the left in the picture below. 1. 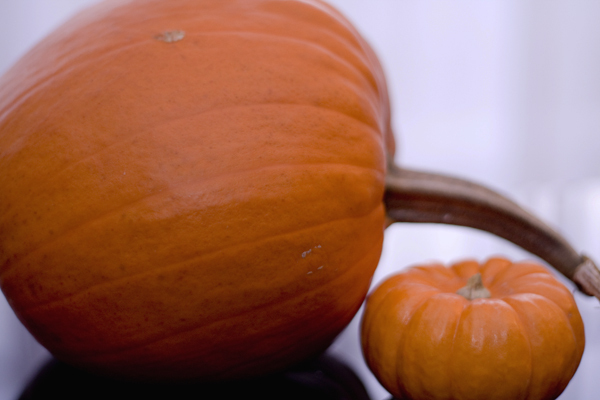 Find a sugar pumpkin at your local Farmer’s Market. Regular grocery stores will carry them as well. Cut the pumpkin in half. Use a big, sharp kitchen knife and be careful as it will be quite difficult to cut. Watch your fingers! 2. Scoop out the pumpkin pulp and separate the seeds from the pulp. Save the seeds if you’d like to roast and eat them. 4. Cut the pumpkin into slices like you would a watermelon and place on a baking sheet. 5. Bake the slices of pumpkin at 375 F for one hour and a half. You’ll know it’s done when you can easily pierce the flesh with a fork. 6. Remove the pumpkin from the oven and allow it to cool. When it has cooled, scoop the pumpkin flesh from the rind and put in a food processor and pulse until smooth. Discard the rind. 7. Store in a glass mason jar in the fridge for up to three days until ready to use the puree. You can also freeze the pumpkin in a plastic bag. 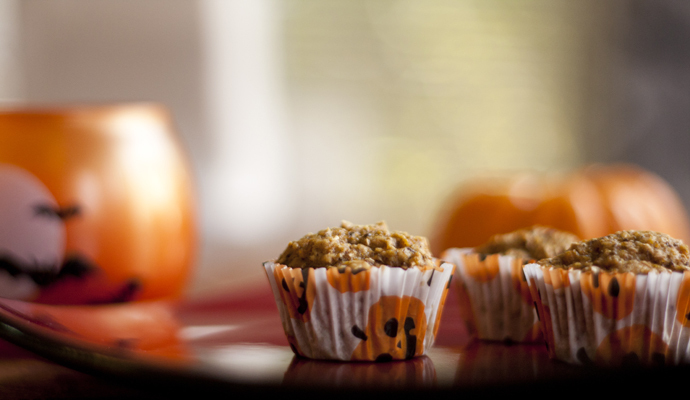 Next week we’ve got a pumpkin mini muffin recipe that will make use of this puree! Check back for it next Sunday! My method originally appeared on The Calgary Journal Food Blog. I love that! I would love for you to post it at my SHOW-licious Sunday Craft Showcase! http://sewliciousdecor.wordpress.com. Sure, feel free to share 🙂 Thanks for stopping by!